Albert Einstein’s General Theory of Relativity which established the relationship between matter, space, time and gravity, governs modern cosmology's view of the universe. But when Einstein began to apply his theory to the structure of the universe, he was dismayed to find that it predicted either an expanding or contracting universe--something entirely incompatible with the prevailing notion of a static universe. In what he would later call "the greatest blunder of my life," Einstein added a term called the cosmological constant to his equations that would make his calculations consistent with a static universe (1). Einstein admitted his mistake in 1929 because Edwin Hubble showed that distant galaxies were receding from the earth, and the further away they were, the faster they were moving (This does not sound great, because it violates Einstein's speed limit). Hubble discovered that the light coming from many galaxies was shifted toward the red, end of the spectrum. The more distant the galaxy, the greater its redshift is, and therefore the higher the velocity, a relation known as Hubble's Law. The simplest interpretation of this "redshift" was that the galaxies were moving away from us, based on Doppler Effect (2). That Hubble’s discovery changed cosmology tremendously: It gave rise to Big Bang theory and Inflation theory as the standard cosmological models, and the Expanding Universe (or Steady State theory as alternative to the standard). They all agree on the Universe expands (3). In short, Hubble proposed that the redshift was caused by a Doppler effect due to the receding movement of the stars and galaxies, which logically suggested an ever-expanding universe. It has been further proposed that this expansion originated from a big bang (4). The following is considered as an "anti-example" to Hubble's law: Redshift was caused mainly by dark matter, dark energy, or some things else such as cluster of galaxies' gravitational lensing, not from galaxies moving away from us. Let's talk about dark matter and dark energy: According NASA Science (5) the composition of the universe contains 68% dark energy, 25% dark matter, and only 5% normal matter. Dark energy is cosmological constant, a constant energy density filling space homogeneously which Einstein added into his equation to grant a static universe. Over 65 years ago the Swiss astrophysicist Fritz Zwicky noticed that the speed of galaxies in large clusters, such as the Coma cluster, is much too great to keep them gravitationally bound together unless they weigh over one hundred times more than one would estimate based on the number of stars in the cluster. Decades of investigation confirmed his analysis, and in the 1970s further evidence for dark matter was found from gravitational studies of matter in the outer parts (the halos) of ordinary nearby galaxies (1). Dark matter is thought to be a strange form of matter. It is all-pervasive in the universe. While astronomers can’t directly see dark matter, its effects can still be observed. When a large amount of dark matter gathers in one place, such as the halo around a galaxy, it will exert a massive gravitational force. This field is so strong it can bend the path of light beams passing near it. The light from a distant galaxy has been bent so many times before coming to us, because of many layers of dark matters or cluster of galaxies or ... in universe (this might be a way to find out if dark matter exists or not? 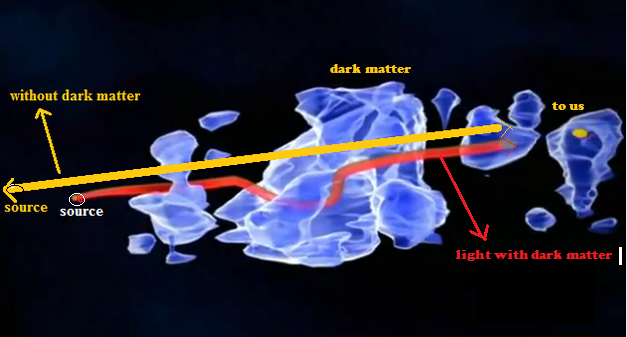 Scientists should study trajectory of light in universe to see if it has been bent by dark matter). When the light has been bent, it is stretched or its wavelength is stretched (redshifts). This effect might be thought as: if there were no dark matter in universe, then the sources of light would move away from us (same duration of time) or the space between us and the light sources increased. This expanding stretched out the light caused redshift (see picture below). That was Hubble's law! Hubble thought that distant galaxies moved away from us caused redshifts based on Doppler Effect. 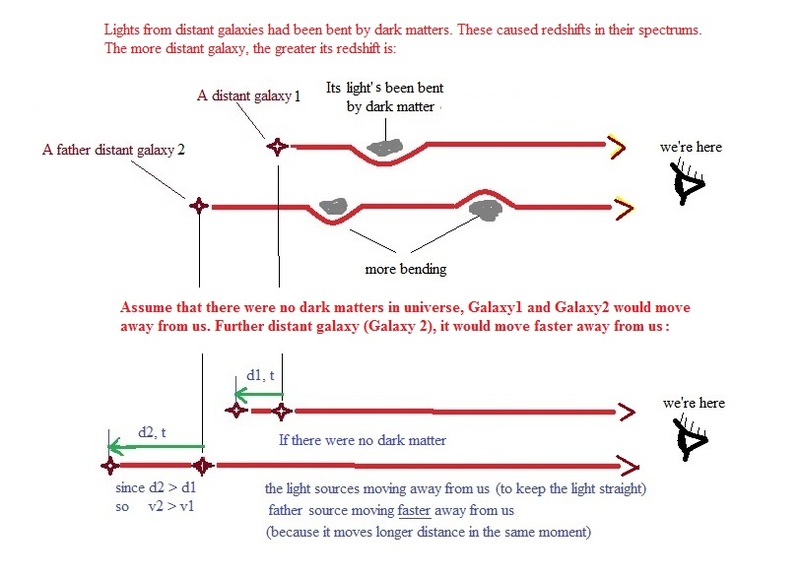 Not only dark matter caused redshift, but dark energy also caused redshift. All ordinary matter objects including photons which move through dark energy will be experienced a "friction", that slows down photons as they travel vast distance. As we know energy of a photon E = h.f (h is Planck constant), because photon loses its energy, frequency f is decreasing or wavelength is increasing (redshift). The more distant the galaxy, its light has been bent more by dark matters or cluster of galaxies (more redshift). If there were no dark matter or galaxies blocked the light, then the source of light would move away from us faster as pictures below (Hubble's law). For distant galaxies move toward us, their lights were blueshifted; however, the lights have to go through many layers of dark matters and dark energy before coming to us which caused more redshift. The more distant the galaxy, the greater its redshift is. Therefore, what Hubble saw in spectrums were just redshifts (not blueshift) and he concluded that those distant galaxies were moving faster away from us! It is a flaw! For those cases, Doppler Effect was too small compare to dark matter's, dark energy's, or galaxies' effects which led Hubble to a wrong conclusion. For galaxies close to the Milky Way, the role of Doppler Effect might greater than the dark matter’s and dark energy's effects. Therefore we can see some cases of blueshifts, for instance Andromeda. For both cases, much more redshifts are observed than blueshifts. This conclusion is exactly what is observed! Isaac Newton and Albert Einstein were right to protect the fact that Universe was static. Einstein should not worry about universe expands from Hubble's law. He can take back his words “The greatest blunder of my life”. In conclusion, Hubble used Doppler Effect as the main reason to explain redshift because there were no concept of dark matter and dark energy at his life time (which make 95% composition of the universe!). Unfortunately, his works drove astronomy deep into a wrong path: Scientific community wasted time, money, and noble titles such as Ph.D., Professor, and even Nobel prize in physics (2011). Scientific Community needs to have a new standard cosmological model to replace for Big Bang, Inflation, and the Expanding Universe theory.